Here’s my current map of the continent of Avornea for my homebrew setting of Malune. Both of the Malune campaigns that I have run have taken place near the mountains called the Iron Peaks, but my next campaign is going to start near the city of Free Port on the shores of the Azure Gulf. There are still a lot of relatively blank areas on the map that I’m working to fill in, but I’m not in too much of a rush since it is nice to have some easy places to drop in new ideas that hit me. Over the years, the geography has changed a bit and maybe I’ll post some older versions for comparison. 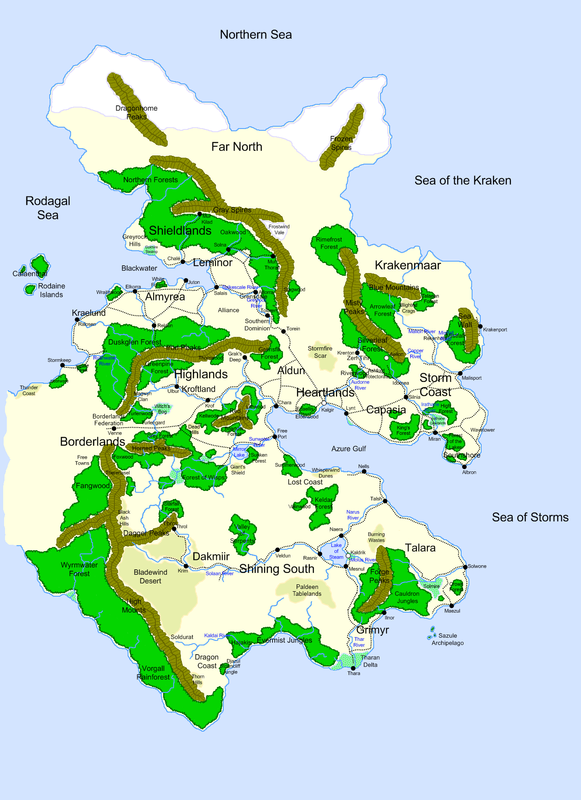 I even have a map from my 3.5 campaign that shows the entire world rather than just Avornea, but those areas haven’t ever been developed other than some rough region labels. Escape – Marakoon Caves 8 cont.